You are receiving this email because you subscribed to the Australian Shepherd Lovers Newsletter. This newsletter is also available online here. Christmas has a way of sneaking up on me for some reason. What seems like lots of time in October, turns into plenty of time left in November, to crunch time in December. (Even this newsletter is a bit late this month.) If you're like me and you're still looking for last minute gift ideas—but it's too late to order anything online and get it delivered in time, I have some ideas. Our Official Guide To Australian Shepherd Training & Care is an ebook that you download. Immediately after ordering (no shipping, no waiting) you will be sent a download link in an email. For gift giving you can just give a card with a note telling the giftee to check their email. (Of course, you've just forwarded them the email with the link for them to get their ebook!) More info about the ebook and ordering here. What about a comprehensive online video-based dog traing program? Created by a professional dog trainer from New Zealand, "Doggy Dan," this highly recommended program covers everything from the foundations to advanced concepts of dog training as well as how to deal with specific behavior issues. Again there is nothing to ship or wait for. You sign up... and get the access information to the membership site. Just give that info to the gift recipient and they can log in right away and start learning. If you want to give them one month access just cancel after that, two months; same thing. Or you can get the best value and give them 6 months access—it just depends on how naughty or nice they have been this year. ;-) Get more info on The Online Dog Training program here. What if you want to give something that really does have to be shipped and delivered? Just print out a picture of your gift and give it to them in an envelope as a placeholder until the real thing arrives, or keep it a secret and just let them know in a note in a Christmas card that "something" is coming for them and it will be arriving soon. For example, there are many Aussie or general dog related t-shirts, sweatshirts, and hoodies that make great gifts that will be enjoyed all year long. Check out our curated collection of great t-shirt designs here. Any of the above are great for any time of the year, but if you are pressed for time I hope it helps you get your gift shopping done, even if it is just in the nick of time. Wishing You and Yours a Merry Christmas and a Very Happy New Year! If someone you know has forwarded this newsletter to you, you can subscribe here to make sure you automatically receive future issues. Puppy care tips are an essential for any new dog owner. Here are some tips to get you started with your new puppy. Why Use A No Pull Dog Harness? A no pull dog harness can be an effective and humane way of training a dog that is aggressive or reactive on leash. 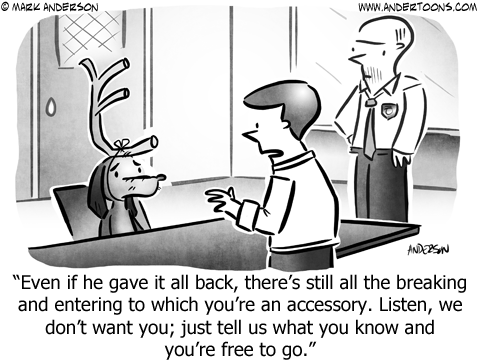 Personalized dog collars are a great option if you want to make sure that your dog can be returned to you if lost. Companion dog training involves learning obedience commands and demonstrating aptitude to earn AKC certification. Choosing the best dog breed for you is a very important decision and will require research to find the best match. Does Glucosamine For Dogs Help With Joint Issues? Glucosamine for dogs is being offered by many vets as a viable treatment for joint issues such as osteoarthritis. How Aussome Is Your Aussie? Why not tell us about them?! Create a page all about your Aussie and include up to 4 photos! 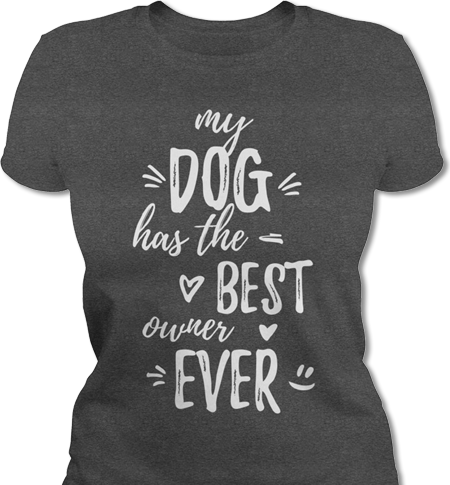 "MY DOG HAS THE BEST OWNER EVER"
T-Shirt (Men's, Ladies, V-Neck, Tank Top, Longsleeve), Sweatshirt, and Hoodie Styles Available. 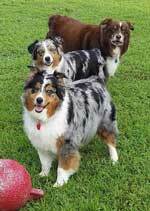 Thanks to Jackie Lewis for submitting this photo of her three Aussies, Belle, Bonnie, and Buddy. Download Your Copy Today... New Version 2 is Here! For those of you who are not familiar with our ebook "Guide To Australian Shepherd Training & Care," it is a guide that has proven popular with our readers and includes hundreds of photos submitted by fellow Aussie Lovers like you. Thanks to everyone who has supported the project with photo submissions and purchases of the ebook as it not only gives you the information you need, but it's one of the ways that helps us to be able to keep doing what we do. Don't have your copy yet? Order it here and download it today! Learn By Watching How A Professional Dog Trainer Does It! I highly recommend professional dog trainer and dog behaviorist "Doggy Dan" and his comprehensive video-based online dog training program. Are You Into Dog Agility Training? Calling All Breeders—If you are an Australian Shepherd breeder please make sure your listing is up to date. I have made many improvements to the Premium Listings (and dramatically reduced the annual subscription). Whether you opt for that or want to continue with a free listing I still need to hear from you. You can find out more at the following link or email me if you have any questions. https://www.facebook.com/AustralianShepherdLovers and click the "Follow" button. Twitter: To follow us on Twitter visit this link and click "Follow". Check back with us often as we are always adding more great information. Please let us know if there is something you would like to see on Australian-Shepherd-Lovers.com. We love to hear from fellow Australian Shepherd Lovers like you. Send us your ideas, your feedback and photos/stories of your Aussie so we can include them on the site. All the Best and Woof! Australian-Shepherd-Lovers.com is Powered by Solo Build It! DISCLOSURE: Many of the products and services we advertise and recommend in this newsletter provide us with an affiliate commission for referrals. Using our affiliate links ensures we are credited for referrals when you make a purchase. We very much appreciate your support. We take this responsibility very seriously and endeavor to only promote quality products and services from reputable merchants and providers. If you are dissatisfied (or very pleased) with the quality of the products or the service provided, please contact us and let us know about your experience.